Chris Anderson, editor-in-chief of Wired Magazine. 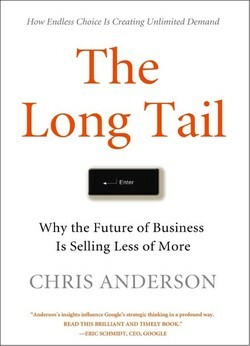 wrote The Long Tail, a brilliant article which first appeared in Wired in October 2004 and will become a book, published by Hyperion, on July 11, 2006. 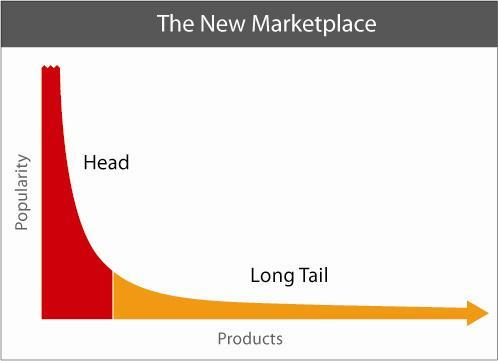 The theory of the Long Tail is that our culture and economy is increasingly shifting away from a focus on a relatively small number of "hits" (mainstream products and markets) at the head of the demand curve and toward a huge number of niches in the tail. …In an era without the constraints of physical shelf space and other bottlenecks of distribution, narrowly-targeted goods and services can be as economically attractive as mainstream fare. Chris has been developing the concept on his blog and now is ready to publish his work as a book. 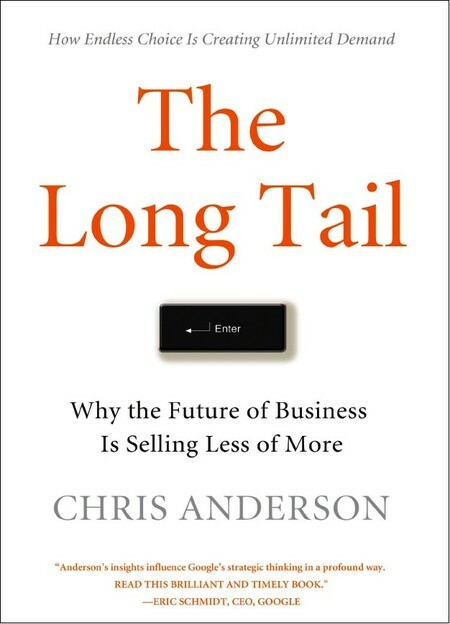 Because the publisher feels that the above long tail graphic will be off-putting to prospective readers, they have come up with a cover graphic which is non-offensive, non-challenging, and non-informative! Does anyone else feel that the use of an enter button is trite, banal, and utterly clueless? I question what this publisher adds to the project except for possible distribution assistance. I think this cover will not attract any new readers and will make the book a much harder sell than one with the original graphic. Read the whole story of the cover with comments from readers who have been following the long tail story from the beginning. Those of you who are self-publishing can add this to your list of questions to ask yourself. Does the cover communicate my ideas to the people I want to reach? Look at this cover and judge for yourself. The text is fine, but the graphic is aimed at a knee-high culture which probably thinks the long tail is something you order to go. This entry was posted in Books, Self-Publishing. Bookmark the permalink. The “long tail” is a concept that was referenced often during the 2006 WebMasterworld Boston Pubcon, a gathering of 2,000 or so internet marketing folks. At the Pubcon, it was used to emphasize the importance of search tails, or in other words secondary search words applied to primary search terms. For example, while a head search would be “photographers” a tail search would be “photographers in orlando florida”. Since there is only one head term, it is extremely difficult to gain exposure on a search engine’s first page of results. However, you can target thousands of tail searches and it’s much easier to gain exposure. You might only get 1 visitor each day for every tail search, but if you’ve got ten thousand pages each suited for a different tail term then the cumulative traffic is significant. The enter button adds absolutely no value, and does a real disservice by not conveying the notion of the long tail. That being said, it would be nice if the long tail graphic had a longer tail, or could use another method to illustrate just how much ‘stuff’ there is in the tail. I chose to self-publish my book for a similar reason to the one you cited. Being a biotech industry insider trying to market a book on the convergent categories of business and biotechnology, I felt that my own connections and industry knowledge would serve me better than those of a generalist publisher who was unfamiliar with my niche.